By Thomas A. Crowell, Esq. * How can you use a state's film tax credits to fund your film? SEE PAGE 63. * You have an idea you want to pitch to a production company; how do you safeguard your concept? SEE PAGE 77. * How can you fund your production with product placement? SEE PAGE 157. * How do you get a script to popular Hollywood actors and deal with their agents? SEE PAGE 222. Find quick answers to these and hundreds of other questions in this new edition of The Pocket Lawyer for Filmmakers. This no-nonsense reference provides fast answers in plain English-no law degree required! Arm yourself with the practical advice of author Thomas Crowell, a TV-producer-turned-entertainment-lawyer. * Even more charts and graphics to help you find the information you need even more quickly. This book is the next best thing to having an entertainment attorney on retainer! Why not download our Routledge FreeBook The Business of Show Business for Creatives? 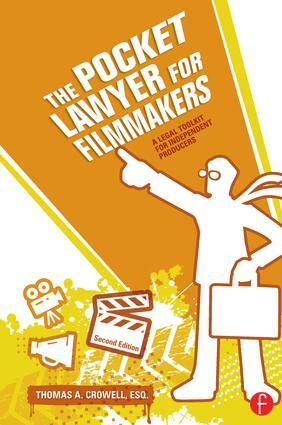 This resource contains a chapter from The Pocket Lawyer for Filmmakers, along with a wealth of other information on getting your film to market.